Join us on a walking holiday along the World Heritage-listed Jurassic Coast – a coastline famous for its 185 million years of geological history, fossil-studded cliffs and spectacular sea views. Stretching 95 miles from Old Harry Rocks in Dorset to Exmouth in East Devon, the Jurassic Coast is a national treasure with an astounding 185 million years of geological history. Thanks to centuries of coastal erosion, the coastline is now famous for its abundance of fascinating fossils that show how animals and plants evolved in this part of the world during the Mesozoic Era, between 250 and 65 million years ago! Stunning sea views, historical landmarks and beautiful coastal walks make this part of the country the perfect place for our walking holiday. 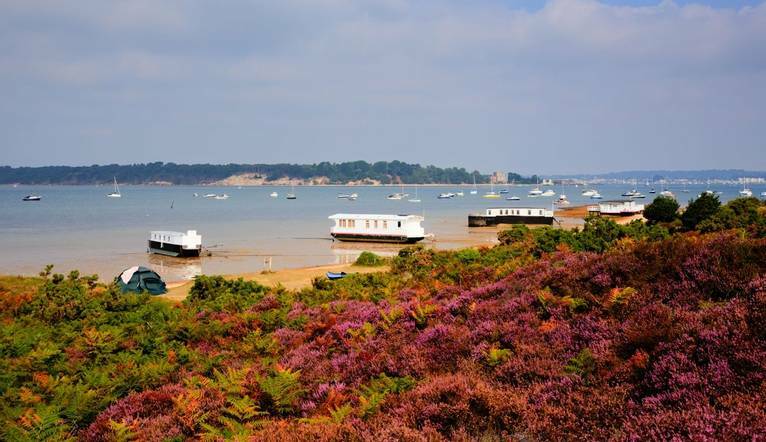 In the morning of our first day we will travel on a coach through Sandbanks before boarding the ferry to Shell Bay. From here we will walk about 3 miles along the beach to Studland and visit Fort Henry where the final D Day practice and senior meeting was held, before moving on to Old Harry rocks, the official eastern end of The Jurassic Coast. This is the youngest end of our UNESCO World Heritage Site, covering a period from 65 - 145 million years ago. Here we can admire the great views that stretch across to the Isle of Wight, Poole and Bournemouth. With our packed lunches, we will stop on Ballard Down for lunch. We will then continue along the Ridgeway, up onto the Isle of Purbeck Golf Course and down spectacular heathland past the Agglestone Rock. On our second day, we will walk to the central bus station in the morning and board the double-decker, possibly open-topped, Purbeck Breezer bus. From here, we’ll take the ferry to Swanage, alighting at the famous Swanage Railway Steam Railway station, rebuilt by volunteers over 30 years following its closure in 1972 by the then British Rail. We will walk through the town and up onto Priest's Way, which was used by the Priest in the Middle Ages to hold his services. After about half a mile, we will turn south towards the Coast Path and then into Durlston Country Park and onto the castle. We stop for refreshments at Café/Restaurant (own cost) before visiting the famous Globe in the grounds and walking back to the bus stop at the station via Peveril Point and the Pier. Enclosed in landscaped gardens on Bournemouth’s East Cliff, our hotel is just few minutes’ walk to the beach as well as the shops and activities of the town. The hotel is located off the A35 and Bournemough station is a 10 minute walk away. Complimentary car parking is available. Great for walkers, facilities here include a restaurant, bar, free Wi-Fi, indoor swimming pool, Jacuzzi, sauna and games room. The traditional style bedrooms feature TV, telephone, hairdryer and tea/coffee-making facilities. The hotel is located off the A35 and Bournemouth station is a 10 minute walk away. Complimentary car parking is available at the hotel. Two guided walks are included in the programme. The walking programme is graded easy to medium and you can expect to walk up to 16km (10 miles) on the first walk and around 7km (4.3 miles) on the second walk. A coach will be used to transfer you to the starting point of the 1st walk.